Jake Kassan went to the community college in Santa Barbara, California, but he couldn’t focus on what to him felt like irrelevant exercises. «I was sitting there thinking, ‘I am back in high school now. I am taking classes that are things I have already learned to some degree,'» says Kassan, in a conversation with CNBC. Kassan, now 25 years old, dropped out when he was 19. His friend and business partner Kramer LaPlante, now also 25, was a semester away from getting his degree from the University of California at Santa Barbara when he left to work with Kassan. Together, the two men launched MVMT watches in June of 2013 with $300,000 they raised through two Indiegogo crowdfunding campaigns. And just over three years later, the Los Angeles-based start-up is a success: It’s on track to meet or even surpass $60 million in revenue for 2016. Kassan’s dad ran his own credit report business until it was destroyed by the recession of 2008, and Kassan learned from watching him how to hustle. «Having an entrepreneurial parent definitely pushes you to learn how to make money,» says Kassan. He also started young. When he was 12 years old, Kassan sold the lollipops his father had been sent as a promotional giveaway. Kassan priced each lollipop at 25 cents, or five for a dollar, and he made between $300 and $400 in a couple weeks. When he was 17, Kassan launched a business selling novelty T-shirts that included a microphone and lights. When the T-shirts sensed noise, they lit up. They were a hit with the rave and night-club party scene. Kassan put his car up as collateral to get a loan from his father for a couple thousand bucks to build inventory. Once stocked up, Kassan drove down to Santa Monica on summer weekends and sold shirts. He added an e-commerce business, NiteLifeDesigns.com, which he promoted successfully by making YouTube videos, a couple of which got more than half a million views each. At its peak, his business, Nite Life Designs, pulled in $10,000 a week. Prior to MVMT, LaPlante launched a wallet brand, Articulate Wallets, on Kickstarter. He raised more than $100,000 from almost 3,000 backers. 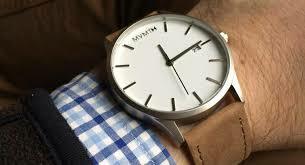 Kassan’s e-commerce background and LaPlante’s crowdfunding experience became the foundation of MVMT. The duo researched watch suppliers in China through Alibaba from their shared Santa Barbara apartment. They talked to about 30 suppliers, asking questions to determine the quality and price points, and they realized that the markup most watch brands added to the wholesale price was staggering. They could sell the same watches that other companies were hawking for about $300 for between $95 and $160 if they cut out the retail middlemen and primarily sold online. They also wanted to try to start a cooler watch company, one that appealed to their own demographic. MVMT Watches is part of a burgeoning generation of e-commerce manufacturing businesses that relies on third-party suppliers, shippers and processors. Their digital strategy is working: In just over three years, their team of 25 has sold more than 600,000 watches. And they have retained their independence. MVMT has scaled their start-up without taking any investment from venture capitalists or angel investors, though more than 20 have approached the entrepreneurs, eager to get in on their growth. «What we have learned: If you don’t have to raise, you shouldn’t,» says Kassan. And so, at least for now, the team is holding off. In 2016, MVMT expanded to include sunglasses, and the company has long-term visions of expanding into other product categories, too. «Right now is really the time that e-commerce is going to take over,» says Kassan.